Her doctor explained that she had gotten a bacterial infection that can only be sexually contracted. Debbie was hospitalized for five days and placed on strong medications. The IV antibiotics she received unknowingly rendered her birth control pills ineffective, and a pregnancy with their first child resulted. So Debbie stayed in the marriage, though she was wronged and mistreated. The shame of it all kept Debbie silent and trapped in an unsafe marriage. Behind closed doors she endured verbal cruelty, and she believed the lies of her abuser. When her husband was in a good mood, things were good at home. But if he was in a foul mood, Debbie bore the brunt of his abuse and anger. Unfortunately, she endured the abuse for a long time before she left. Three kids, twenty-plus years, many affairs, and many lies later, Debbie finally had enough. She mustered up every ounce of courage she could find to leave and divorce her cheating, abusive, pastor husband. You can imagine the scandal that took place in their church. Because the congregation was unaware of their pastor’s abusive and immoral behavior, Debbie was victimized all over again in the court of public opinion. She bore the weight of public shame, humility, anger, accusations, rebellion from her children, and never-ending feelings of defeat and worthlessness. The weight of it all was heavy. So heavy that it pushed her into a deep pit of depression. Debbie lost most everything in the divorce—her house, her identity, her financial stability, her dignity, and almost her sanity. In the aftermath, she even lost the intimate relationship she once had with Jesus Christ. She was still His daughter but had run away from Him. Broken and angry, Debbie felt that God had let her down. She didn’t understand how God—who is supposed to be good, who is supposed to hear our prayers, who is supposed to be our Protector and Defender—didn’t protect her from the betrayal and the abuse. So, like Hagar, she ran to a desert to get away. Only Debbie ran to a desert of sin. To soothe her pain, she temporarily turned to alcohol. The numbness she experienced from drinking brought an all-too-short reprieve from the sharp pains that pierced her heart when she was sober. And though she strayed from the heart of God and rebelled against His ways, He pursued her relentlessly. When she finally realized that her “victim mentality” had allowed her to trust a lying abuser instead of the God of truth, she turned back to the Lord. In His mercy, God has restored Debbie’s broken faith into a beautiful faith. He has redeemed her wounded heart and has filled her with His greater joy. And though, like all of us, she still experiences struggles and pain, by faith Debbie now embraces God’s sovereignty and accepts His healing love. She’s a changed woman. Changed by the unrelenting pursuit of God’s unconditional love. Changed by the One who sees her as precious. That’s what His love does, you know. God’s unrelenting, unconditional love speaks healing to broken lives. Other people can make us feel worthless. It happens all the time…even within the church. If you are in a relationship that beats you down and causes you to feel like dirt, in the name of Jesus reject the lies that are being projected on you. That’s not who He says you are! If you are being mistreated or abused, tell a trusted friend, meet with your pastor, or get with a professional Christian counselor right away. And in all cases pray—without ceasing. No abuser has the right to define who you are, to tell you what you think, to control or manipulate you, to tell you how you feel, or to condemn you for who you are or aren’t. Only the God of heaven has the right to define you, and when you are in Christ, you are perfectly beautiful in His righteousness…not broken. Dear Lord, Thank You for loving me for who I am, where I am. Please help me to accept this truth when I doubt my value and to lean on Your strength and support when I struggle. Have you listened to the GRACEOLOGIE with Gwen Smith podcast yet? Season 2 is now underway! Hang out with Gwen and friends when you go on walks, exercise, run errands or travel. Podcasts are also perfect to listen to as you do household chores! (Laundry anyone?) 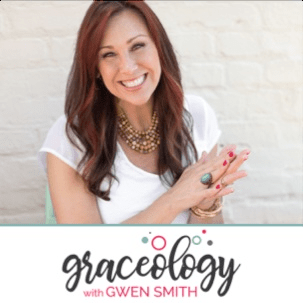 Each GRACEOLOGIE with Gwen Smith podcast episode is filled with fun, faith-focused, grace-filled conversations that will help you know and trust God more. Today’s devotion is an excerpt from Gwen’s book Broken Into Beautiful. Get yours on Amazon here.